Closeup of a gangsa, the most numerous instrument in a gamelan ensemble. The player hits the bar with the hammer and then dampens with the other hand. Dampening can be hardest part. This Saturday, April 18, I’m playing in a gamelan concert. A gamelan is a type of percussion ensemble from Indonesia. There are two main types of gamelan: Balinese, from the island of Bali, and Javanese, from the island of Java. University of Hawaii at Manoa has both type of ensembles, but I’m in the Balinese one. Now, there are actually many types of Balinese gamelan ensembles, so to be more specific, I’m playing gamelan gong keybyar, known for being flashy having sudden changes in dynamics and tempo. The need for flashiness may come from Bali being a tourist destination for over 100 years; there are some forms of “traditional” music in Bali that were invented for tourists. This is not the first time I’ve played gamelan gong kebyar; I also was a founding member of BYU’s gamelan Bintang Wahyu, where “founding member” means none of us had any idea what was going on, at least at first. How does a gamelan ensemble work? I won’t go into detail about the names of the instruments, but the basic idea is that there is really only one melody, and that all the other instruments are elaborations of the melody. The middle has the main melody, and the higher instruments play a faster version of the melody while the lower instruments play a slower version of the melody on down until the gong. There are also some drums that keep the group together and act as conductors, giving tempo and cues. Finally, you may notice there are a few instruments that aren’t percussion—some bamboo flutes and bowed string instruments. A Western audience may think that the instruments sound out of tune. They are “out of tune” on purpose; instruments are actually built in pairs, with one tuned slightly higher than the other, so the audience hears a wave-like sound when the two instruments are played together. It creates a unique sound. Another important part of Balinese gamelan is interlocking parts. The higher instruments actually have pairs of pairs, and one off-tuned pair will play parts that fill in the fast notes from the other pair, so the music sounds faster than an individual player, while also sounding more complex. The final result is a sound that is very unlike Western music. One more thing to notice: no one uses written music. Gamelan music is traditionally learned orally, which is how I have learned how to play. This can be frustrating at times, especially people like me who are used to reading everything. This week, I went to see Patrick Ball, one of my favorite storytellers, perform. He’s an American who tells stories about Ireland and plays the Celtic harp. Among the stories about Ireland and the little folk, he told about how he came to the Celtic harp, the playing of which has undergone a renaissance in the past 40 years. After the peak of the Celtic harp’s popularity in the middle ages, Ball explained, it fell out of favor in Ireland and hadn’t been heard in 200 years. Ball’s involvement actually started with an American engineer who was laid off by Boeing and ending up taking minute measurements of ancient harps in Dublin, such as the Trinity harp (which appears on Ireland’s currency and Guinness beer). Ball then ran into the American, Jay Witcher selling harp reconstructions at a renaissance fair (fitting) and Ball was enchanted with the sound of the instrument. Something that Ball didn’t mention was that harps did not die out in Ireland; in the 1800s, however, the old, metal-string style of Celtic harp was supplanted by a smaller, gut-stringed classical-influenced style harp. Despite the change of models, the harp continued to be a symbol of Ireland, as it had been the symbol of Irish royalty in the middle ages; the new harp replaced the old one in the tradition, some people thinking that the new harp was the old one. Perhaps one reason for the switch is that the Irish had lost their royalty, so the Irish upper class were emulating other European royalty, who in the 1800s turned to art music of the German style. Perhaps for the same reason, the old Irish style of harp playing was lost around the same time period, too (though 200 years was a bit of a stretch). So how can they reconstruct a tradition that no one has seen or heard in over a century? Well, there were two good clues: first, some surviving models, and 2nd, a man named Edward Bunting. There are several surviving Celtic harps from the 15th century, the most famous being the Trinity harp (ironically, evidence suggests that the Trinity harp was made actually in Scotland.). It’s actually kind of amazing that any harps survive, because the tension needed for the strings means that harps basically rip themselves apart over time. 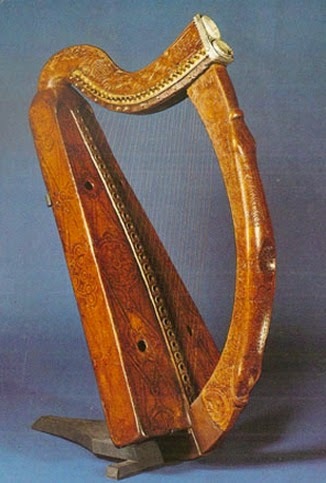 While recreations of these old harps had been attempted earlier in the 20th century, Witcher’s was the most scientific to that date and probably came closer to the original sound than other recreations. As for us reconstructing how the harpers played music hundreds of year ago, in 1792 harpers in Ireland realized that their tradition was fading out, and held a festival in Belfast where ten of the remaining old-tradition harpists came and played. Edward Bunting, an organist, was employed to transcribe what until then had been mostly an oral tradition (many harpers were even blind). Bunting continued collecting after that, and he later published his collection of transcriptions and lengthy commentary as The Ancient Music Ireland. While Bunting may have altered a few of his transcriptions to fit his own musical training, he did manage to preserve something that was just about to become lost to history. So, if you do manage to hear a Celtic harp sometime, remember it’s probably thanks to Witcher, an American engineer, and Bunting, a church organist.